2) the rack end bushings were mixed , the drivers side showed significant play, but the passenger side was tight. I ordered bearings from mcmaster carr, that I think will work with a spacer.. the originals are angular contact ball bearings, 15mm id x 35 mm od x 12 mm thck. looking thru the mcmaster catalog I found https://www.mcmaster.com/#6680k13/=16kgt7i which are very similar, just need to make a 1mm spacer to make them wide enough. Last night I replaced the drivers side rack end bushing. 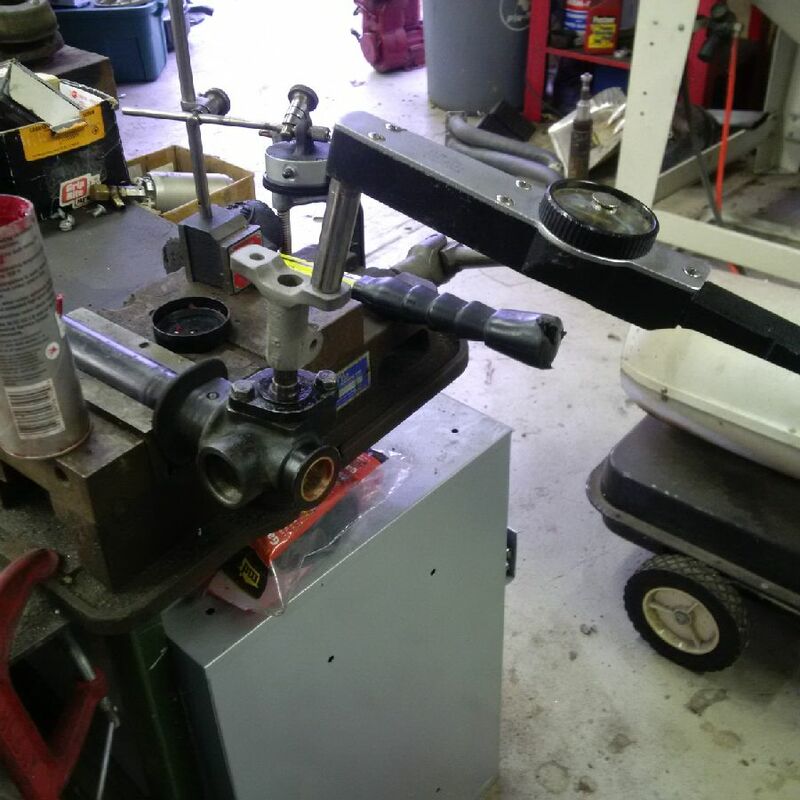 could not get the sleeve bushing to come out with my harbor freight id puller, so I ended up cutting it lengthwise with a hacksaw blade ( almost all the way thru ) and then it pulled easy. I measured the remaining bore in the rack as 1.124" ID. the bushing OD measured 1.185" or so, so to the lathe ! 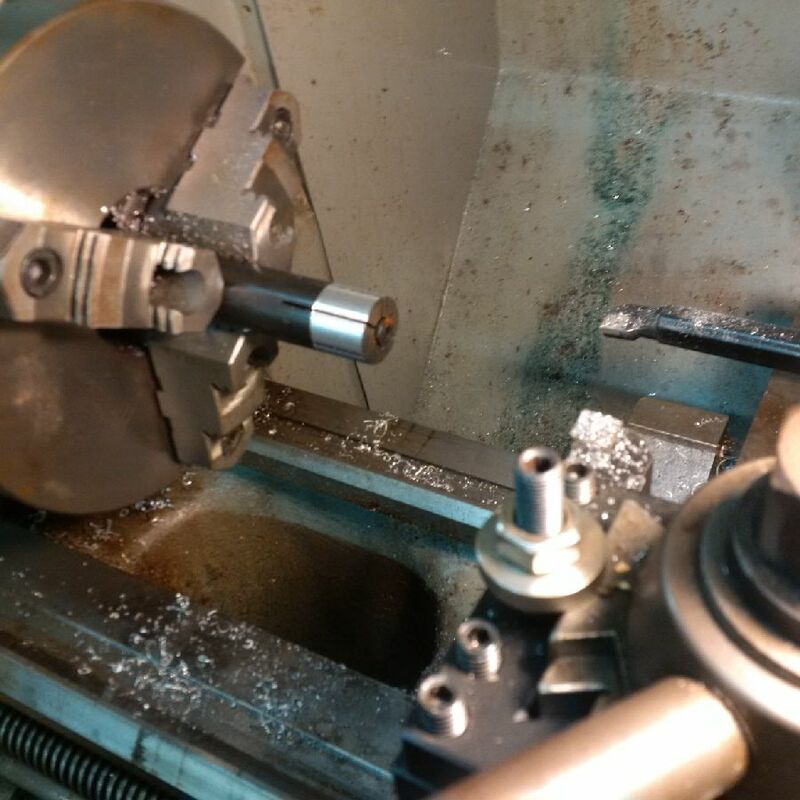 then I put the bushing on it, expanded the mandrel , and turned the bushing OD to 1.125 giving me .001 of press fit. 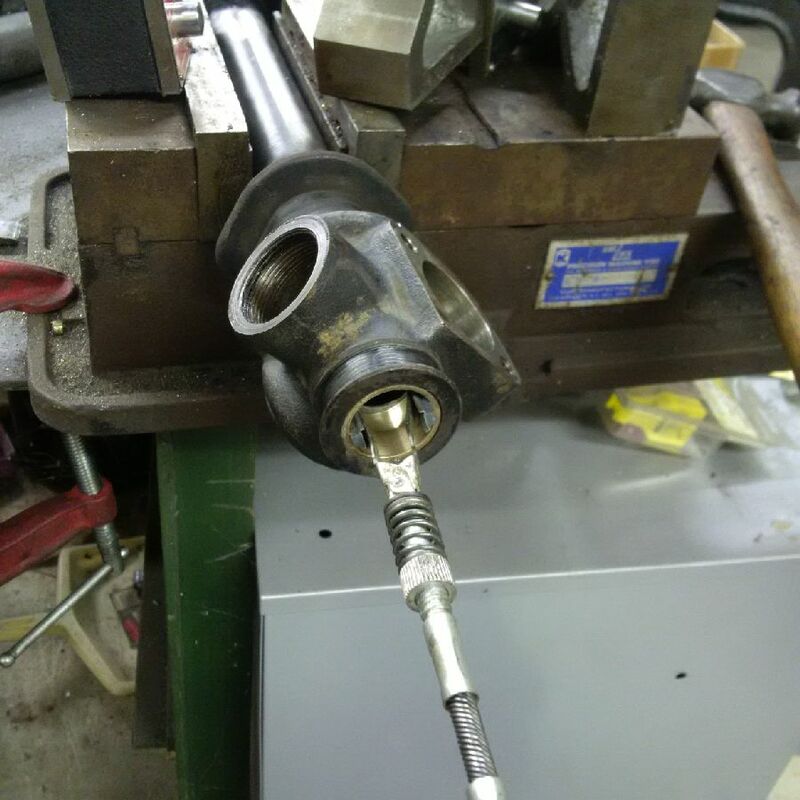 After pressing in to the rack housing, ( using the collet and a hammer.. plus a little torch heat on the housing ) the ID of the bushing had shrunk a bit, so I had to hone it with a brake hone. NIce! next I will work o the pinion bearings and see if I can make them work. Awesome writeup so far and very timely as I have been working on the exact same project (in conjunction with Captain Obvious who has been a great help on this). My plan was to finish this up and do a similar writeup on the original thread that he started, but it looks like you might have beat me to the punch! In any case, a couple of questions for you. 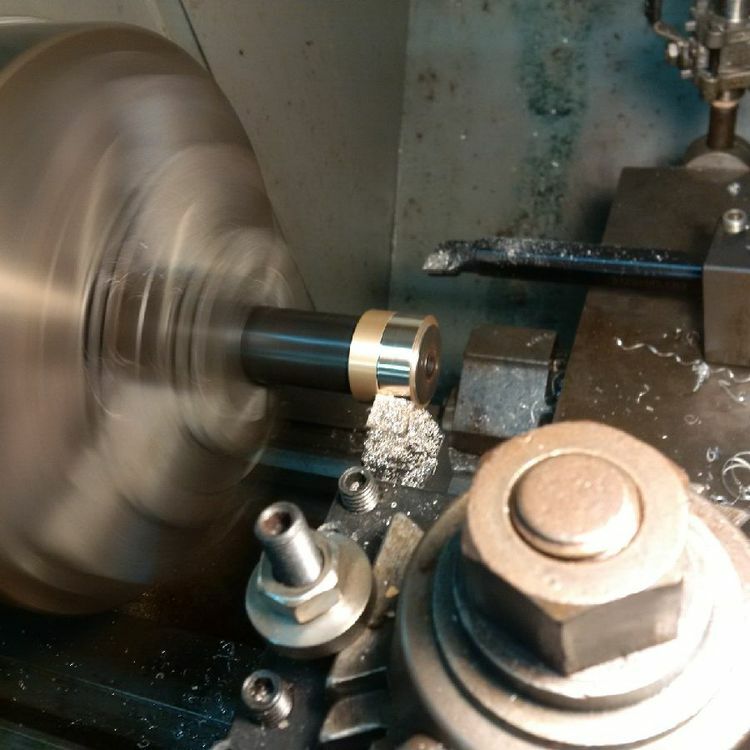 I too could not find appropriately sized end rack bushing sleeves and after numerous tries with units from McMaster and ASB, I ended up purchasing some raw bushing stock and had them machined by a local machine shop here in Austin (unfortunately I do not have my own lathe). However, I looked at the same bushing that you purchased from ASB (Z90-2530) but according to their specs the OD is 28mm which appeared to be too small for the OD of the rack housing which I measured to be approx 1.125" or 28.575mm (which seems to coincide with your measurements). 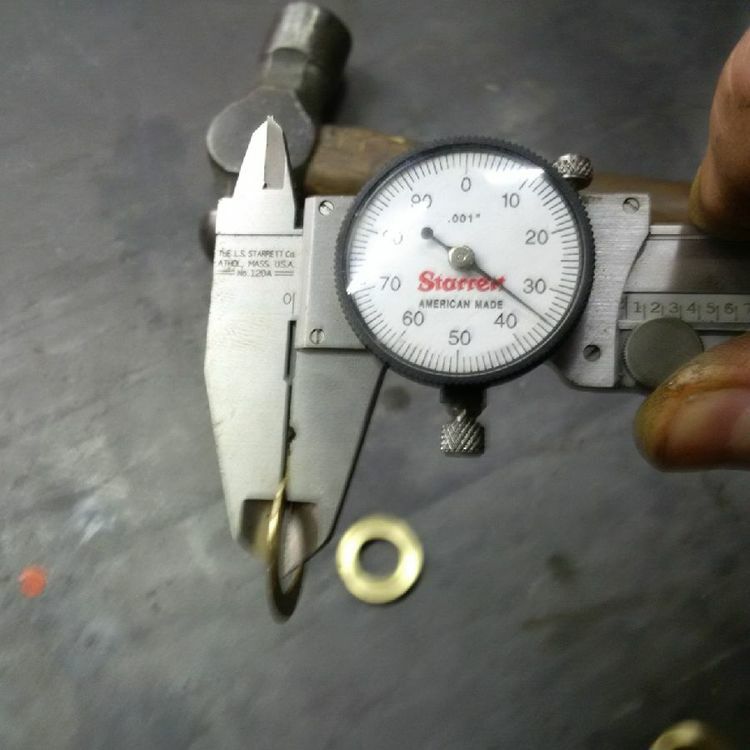 But in your writeup, you indicated that the OD of the bushings you purchased were measured to be 1.185 inches which equates more to about 30mm. So was the bushing you purchased that oversized? Could you please elaborate? In addition, if you haven't already discovered, the bushing on the drivers side is actually shorter than the one on the passenger side. I believe this is the case so that the drivers side bushing does not interfere with the pinion mechanism once installed. As I recall 30 mm was too long so you may want to check this as well. Also I could not find the correct pinion bearing with the appropriate thickness. The best I could do was an 11mm think angular contact bearing that I purchased from VXB bearings (they have a great selection at prices that are much better than McMaster). I also stumbled on a rebuild thread on Hybrid Z from many years ago, and a number of posters ran into the same issues with these bearings. Turns out that one poster had discovered that an L6 valve spring seat was the exact size needed to provide the appropriate shim width and so I did some research and was able to purchase some from Nissan and sure enough they are correct and should work, although I am not yet at that part of the rebuild. In any case, look forward to your continued writeup as well as some clarification on the bearing you purchased from ASB. re-looked at my part #'s , I was not real sure what I needed so I ordered several bushings , looks like I got confused ! the length ( 20mm ) is right for the drivers side, however it would be a bit short for the passenger side, but it would work fine . looking at their web site they have options that are longer not sure how long the passenger side is but the same bearing is available in 25,40, and 50mm lengths http://asbbearingsonline.com/index.php?main_page=index&cPath=86&sort=20a&page=9 . I chose to not replace the passenger side because it was not worn at all. Great write up. Do these specs also apply to the 240 / 260? 1. The 2 racks are different. According to the parts fiche that I have the original 240 rack was obsoleted in July of 73 which is when the newer racks started to be used in manufacturing. So I suspect some late manufacture 240's even had the newer rack. 2. Also the very original rack had a "grease reservoir" on the passenger end and this was supposed used to ensure that the rack was properly lubricated over time. However at some point before they switched to the newer rack they eliminated the grease reservoir and plugged it. Everything else remained the same as far as I can tell. 3. According to the parts fiche again, the end housing bushings have the same part number between the two racks so I presume from that that the rack and housing, at least dimensionally, are the same. I have just recently dismantled one of the early racks but have not yet had a chance to remove the end bushings to verify that the dimensions are the same between the two. 4. The big difference between the two different versions is in the pinion design. The original rack has a larger diameter pinion (gearing is the same) and only uses a ball bearing on the top side. The bottom end of the pinion rides in a brass sleeve bearing, which as near as I can tell is not serviceable. The FSM states that if there is excessive play in the brass pinion sleeve, the entire rack housing assembly needs to be replaced. I have not attempted to remove the brass sleeve bearing from the 240 rack that I have just dismantled, but I do plan to take a look and see if that is possible. The later rack uses 2 angular contact bearings, one on the top and the other on the bottom and both are serviceable. 5. 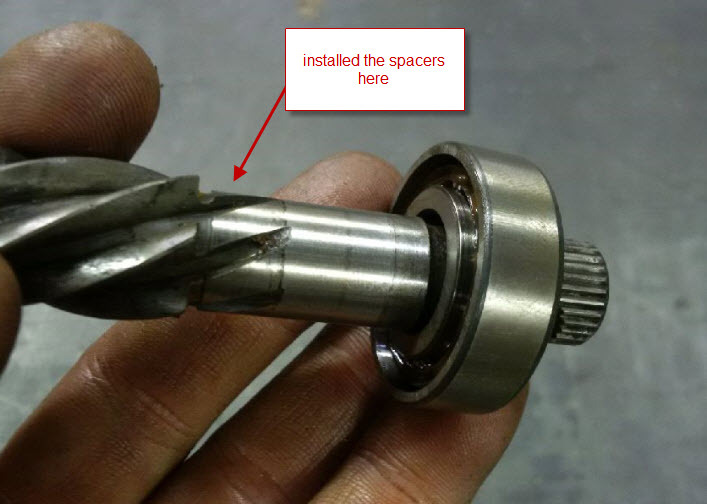 The other major difference in the pinion area is the method in which the pinions are secured to the rack housing. In the case of the original rack, the pinion is held in place with a large C clip in the pinion housing itself. It then uses a large oil seal over the end of the pinion gear that is pressed into the pinion housing. On the later rack, the C clip is eliminated and they utilize an oval shaped bracket which goes over the end of the pinion (with spacers to ensure proper preload) and is secured to the rack housing with two bolts. All in all I believe that newer rack is an upgrade to the original as more of the internals are serviceable. 6. Finally, the rubber or poly rack bushings are different sizes between the two racks. That's what I know so far. As I learn more from the rebuild of the newer rack and the dismantling of the older one I will post updates. So here's an update from my last post on the similarities / differences between the different steering racks that were used over the course of the S30 series. 1. The racks themselves are the same across both generations of steering systems. The dimensions between the two are identical (25mm rack OD) and as such the bronze sleeve bushings used on each of the rack housing are the same across all models. I can confirm that these bushings fit in either an early rack housing (manufactured up to July of 73) or a late rack housing (manufactured from August of 73 on). I have pressed bushings in both housings and they are the same. 2. There were two styles of inner tie rod ends but these do not seem to correspond to the timing of the different generation racks. I have a rack in my possession that uses the newer style inner tie rod end but was a part of the early rack generation. These later units were the ones that were welded together and not serviceable (although I do believe that Eurodat has successfully dismantled one of these and refurbished them). The earlier style inners could physically come apart although it is not clear to me what you could actually service other than cleaning it out and applying new grease. 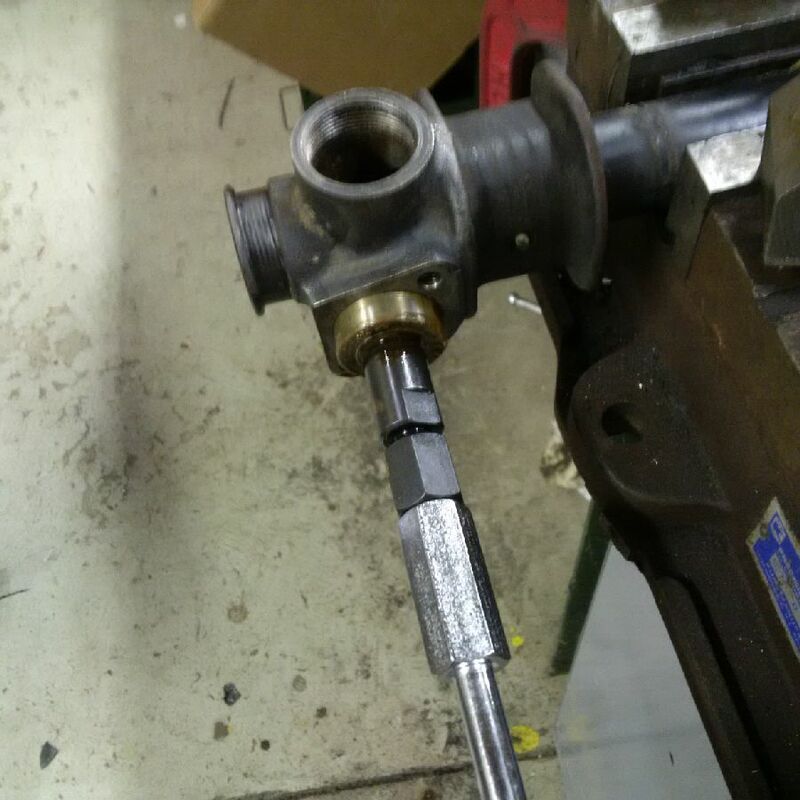 I have included a photo at the end of this post showing the 2 different generations of inner tie rod ends. 3. As I stated in my last post, the most significant difference between the two generations of racks was in the design and implementation of the pinion. The early pinion design used only a single ball bearing at the top of the pinion which was pressed onto the pinion shaft and held in place with a C clip. The bottom of the pinion rode in a bronze sleeve that is pressed into the bottom of the rack housing. As near as I can tell this sleeve bushing cannot be removed and therefore is not serviceable. This corresponds with the statement in the FSM which indicates that if there is excessive play between the bushing and the pinion, the entire housing needs to be replaced. The pinion diameter (where the ball bearing sits) is also physically bigger on the early generation (17mm versus 15mm for the later generation). The second generation pinion uses two angular contact bearings, one at the top and one at the bottom. The bottom one is actually pressed into the rack housing but can be removed with a blind bearing puller. Therefore both of these are serviceable. 4. The pinions are also secured into the rack housing differently. In the early generation, the pinion is held in the housing with a large C clip. 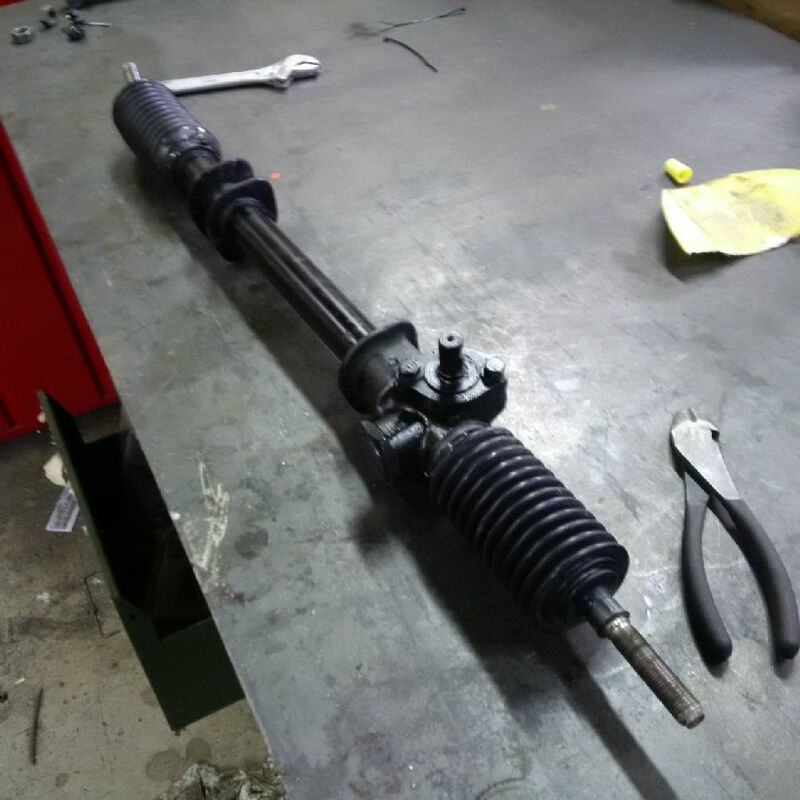 On the newer generations the pinion is held in place with a "cover" that goes over the pinion shaft and bolts into the rack housing. 5. There are also differences in the rack adjustment system as well. The early generation uses a smaller bronze / brass "slug" (which rides on the rack) than the later generation. As a result, the adjustment screw and lock nut are smaller on the earlier racks as compared to the later ones. I have included a picture below which will highlight all of these differences. So that's it for now. If I discover anything additional, I will provide an update to this post. 260's began production in July '73, so all 260's and 280's will have the same rack. Maybe some of the last 1973 240's also, depending how late they were in production. finished up the rack this week..
the shop manual specifies checking the turning torque. so I checked it with a small dial torque wrench rigged with a steering spline piece, It was within specs. I then installed the rack and the mesh adjustment shoe ( had to work the shoe with a bit of sandpaper to get it to move freely in the bore ) . 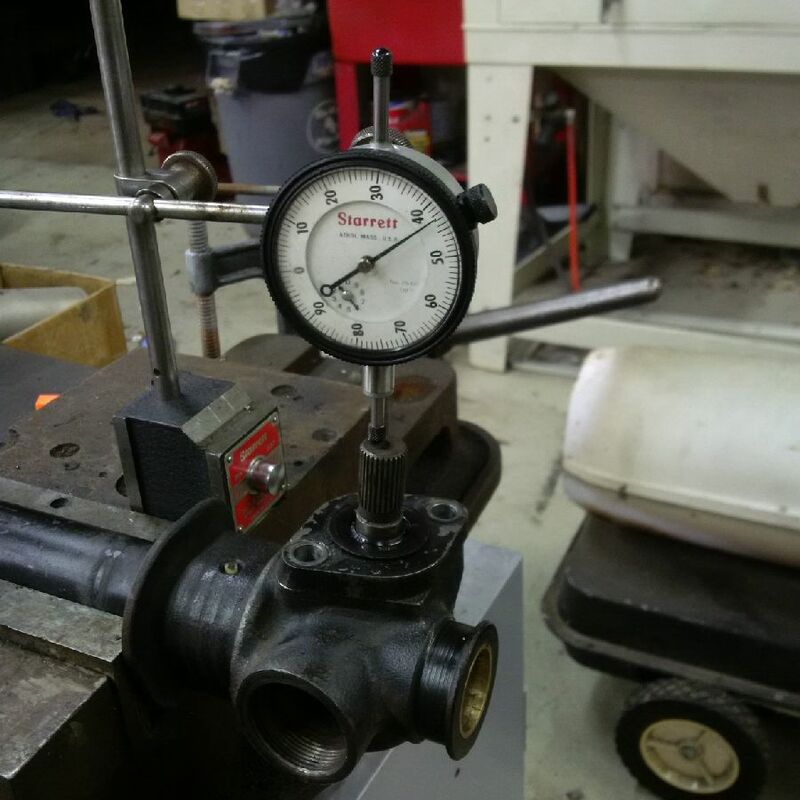 adjusted the preload while taking torque measurements. ( never quite understood why there are shims under the spring, I just adjusted the positioned the big screw cap and locked the jam nut ? ) . got the torque within spec, but it always had a tight spot on one side of the travel.. not even torque all thru the travel. Nice write up, great pics. I have a spare rack that I think I will try the torque test just to see where it is. Thanks for writing this up Plucker. Nice work. Nice work. I recently went through a bunch of discussion with @Mike W about this exact topic of rack rebuilding, and one of the topics was the spacer to be used to take up the gaps created by the thinner bearings. If it were me, I would do the spacing on the outer race instead of the inner race. My thinking is that there is a much greater load area and you can spread the forces across the whole spacer instead of just the end profile of the pinion teeth. Might not matter, but I would use the outer race. My thinking would be... Drop in a spacer of appropriate OD FIRST before you pressed the lower bearing back into place, and then place a second spacer similar on top of the upper bearing right before you screwed the retaining cap back onto the housing. Or, as an alternative, you could put both spacers on one end or the other, but if you wanted to keep the pinion gear in the same location on the rack, you need to put spacers on each side. I don't think I would go back in to change anything, but just some academic stuff to think about? I agree partially, I would have picked one on the back side of the bearing, however when I found the shims that fit the ID perfectly and they were machined. I realized that spacing out on the ID would work just as well. Also the axial location of the pinion does not matter. 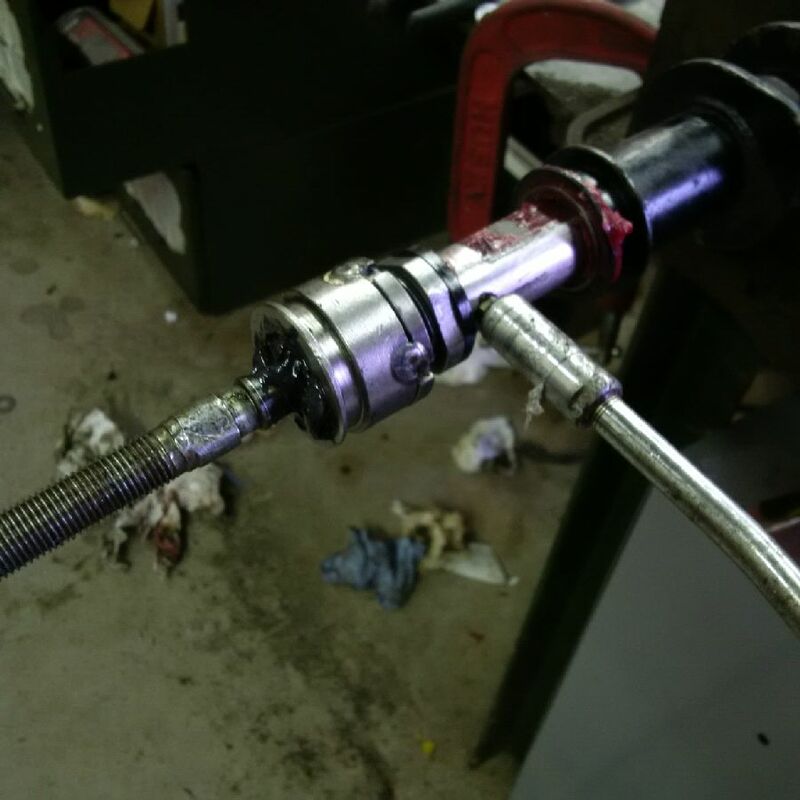 as long as you don't run into the rack with the bearing, it wont care at all where it is , unless your pinion is worn out and you need to match the wear marks. axial play and preload are important, location is not. while I agree in theory with your points, but practically I think you have to remember this is a rack and pinion, not a high speed, high load application. I will report if it works out ok !